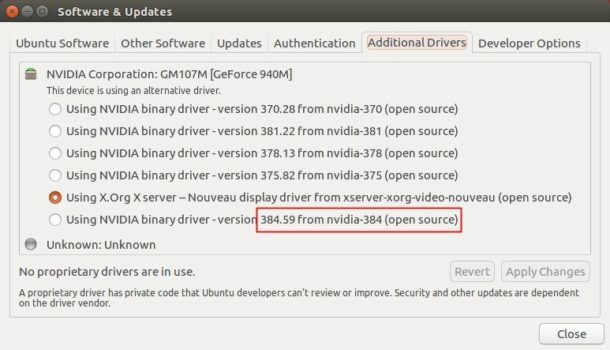 The latest long lived Nvidia driver series for Linux has reached the 384.59 release. It features new GPUs GeForce GT 1030 and GeForce MX150 support and various bug-fixes. Fixed stereo eye assignment not applied in the nvidia-settings. Fixed hibernate to hang during suspend when SLI enabled. Fixed that sometimes OpenGL applications locked until X receives input. Fixed a bug that caused VDPAU playback to be corrupted. Restored several sanity checks that were inadvertently removed from the 355.06 driver. Added support for a “Nearest” transform filter in the X driver. Fixed a bug that could cause hanging and Xids when performing RandR transforms with Overlay and SLI enabled. Fixed for HDMI audio devices when they were hotplugged or unplugged. Fixed kernel panic when hotplugging HDMI displays on some Zotac mini PCs. And see more in the release page. It’s NOT recommended to install these proprietary divers for beginners. It may cause issues and break your system. You MUST know how to restore your system before getting started. For Ubuntu 14.04, Ubuntu 16.04, Ubuntu 17.04, Ubuntu 17.10, the new driver has been made into the Proprietary GPU Drivers PPA. 2. Then you’re able to install the driver via Additional Drivers utility. You may need to boot into recovery mode -> root prompt, or press Ctrl+Alt+F1 on login screen to get into command console.